Gregoria Mariska Tunjung reached her first quarter-finals at a World Tour Super 1000 event when she beat Beiwen Zhang today at the VICTOR China Open 2018. 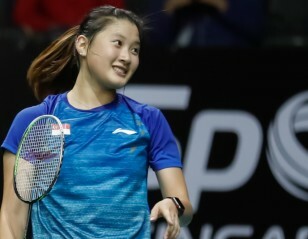 The World Junior champion showed more evidence that she could be among the ones to watch in Women’s Singles as she showed great maturity and presence of mind in working her way out of difficult situations against the experienced Zhang. Tunjung’s deft skills, particularly her control at the net, helped her open up the court and she stayed ahead all through the first game, with Zhang having to scramble to catch up with her. The Indonesian had two game points; Zhang saved both and earned a game point of her own, but Tunjung showed the missed opportunities hadn’t deflated her; she stayed in the rallies and pocketed the last three points. Zhang enjoyed a strong start in the second and had big leads of 12-6 and 17-12 on a slew of errors from Tunjung, but again the Indonesian showed composure to hang in and reduce the deficit. The centrepiece of her game was her netplay, her soft touch enticing the shuttle to die just above the tape, leaving Zhang no openings for attack. Tunjung quickly caught up at 18, and saved one game point before clinching the match. “I thought I had a chance,” said Tunjung. “Not that Zhang could be easily defeated. My game is still impatient, I attacked often despite not being in a position to do so. I should have played patiently, getting into the rally so that I could adjust my game to the conditions. I lost a lot of points early in the second game when she changed her pattern of play. 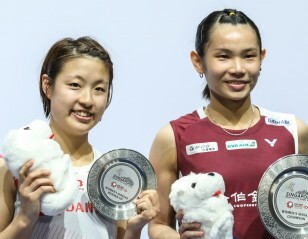 The World Junior champion will next take on last year’s World champion, Nozomi Okuhara (Japan), who stopped Thailand’s Pornpawee Chochuwong 21-9 22-20. In the top quarter, China’s Gao Fangjie, who yesterday upset top seed Tai Tzu Ying, followed up with another strong performance, against Thailand’s Nitchaon Jindapol, to earn herself a quarter-final against sixth seed Carolina Marin (Spain). Tunjung’s compatriot in Men’s Singles, Anthony Ginting, sent top seed Viktor Axelsen out of the tournament. The Indonesian capitalised on some unsteady play by the Dane in both games, coming away a 21-18 21-17 winner. Axelsen looked uneasy through the first game and even called for medical help in the second, later revealing that he was having some breathing trouble due to asthma. In the lower half of the draw, India’s Kidambi Srikanth survived a match point against Thailand’s Suppanyu Avihingsanon to book a quarter-final against the in-form Kento Momota (Japan), while Hong Kong’s Ng Ka Long takes on second seed Shi Yuqi (China). Shi had a fight on his hands from Korean veteran Lee Hyun Il, who demonstrated some sublime skills through most of the contest; Shi however was quick to pounce on the few openings he got in the third, and he came away a winner at 19-21 21-18 21-15. The Women’s Doubles will see a repeat of the World Championships final between Mayu Matsumoto/Wakana Nagahara and top seeds Yuki Fukushima/Sayaka Hirota, with both pairs enjoying straight-games victories in their second round matches. Two more Japanese pairs – Misaki Matsutomo/Ayaka Takahashi and Shiho Tanaka/Koharu Yonemoto – joined them in the quarter-finals. 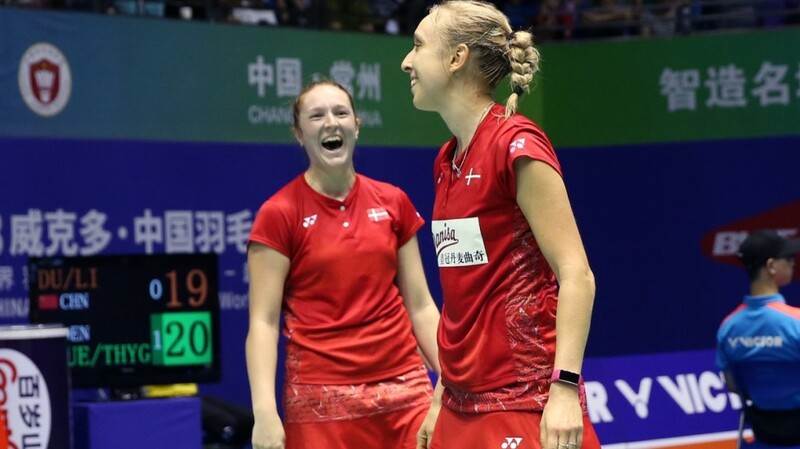 Denmark’s Maiken Fruergaard/Sara Thygesen (featured image) held their nerve to earn a 21-18 21-19 victory over local hopefuls Du Yue/Li Yinhui and will next face second seeds Matsutomo/Takahashi. The Men’s Doubles and Mixed Doubles saw the fall of two experienced Indonesian pairs – Mohammad Ahsan/Hendra Setiawan and Tontowi Ahmad/Liliyana Natsir. Ahsan and Setiawan were blown away by China’s Huang Kaixiang/Wang Yilyu, while Ahmad/Natsir lost their way in the third against Japan’s Yuta Watanabe/Arisa Higashino. Indonesia suffered further blows in Men’s Doubles with the fall of Fajar Alfian/Muhammad Rian Ardianto to China’s He Jiting/Tan Qiang 21-17 12-21 21-17, and Berry Angriawan/Hardianto Hardianto to China’s Han Chengkai/Zhao Haodong. China, in fact, saw as many as four pairs make the last eight. He Jiting/Tan Qiang were joined by Huang Kaixiang/Wang Yilyu, Han Chengkai/Zhou Haodong and second seeds Li Junhui/Liu Yuchen in the quarter-finals. In Mixed Doubles, eighth seeds Chris Adcock/Gabrielle Adcock (England) were shown the door by Thailand’s Dechapol Puavaranukroh/Sapsiree Taerattanachai. THe second game was an absolute cracker, with points going neck-and-neck from 10-all to the end. The Adcocks had two match points, but the Thais kept themselves in the hunt, before taking the third game rather comfortably for a 17-21 25-23 21-16 win. Another pair that survived two match points was Hong Kong’s Tang Chun Man/Tse Ying Suet, who fought off perilous situations against Malaysia’s Tan Kian Meng/Lai Pei Jing at 19-20 and 20-21 in the third before coming through, 19-21 21-16 24-22.